M.K.Davis has been researching the Patterson Sasquatch film for the last 20 years. He has traveled extensively and has amassed one of the largest collection of images from the film. M.K. 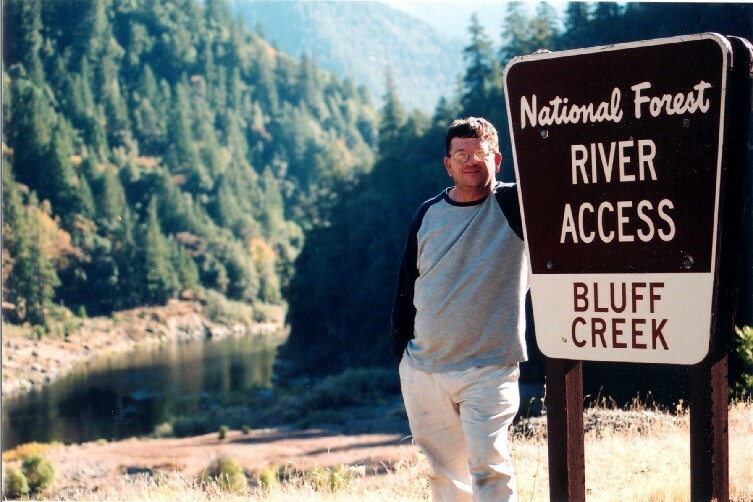 has trekked the Bluff Creek drainage of Northern California on many occasions and his observations have led to several important discoveries on the film itself. While the Patterson film is only a very short piece of film, it continues to yield vital data that may one day lead to a more complete understanding what it is that is on the film and what it means to all of us . Great site. Can’t wait to see new installments. Thanks Aaron. Keep a regular check on the site. Thanks, M.K. I want to compliment you on your analysis work, Mr. Davis. It’s certainly intriguing. What I appreciate is that the work you are doing is not easy. It’s highly technical and tedious to accomplish. Not many could or would do this work yet it has, in my opinion, furthered the study of this creature in a meaningful way. Yes, a very good site and I guilty of relying on other sites for snippets of your work. i got burned out on all the conflicting and bad info on the web…..this is an upper for me! If you are able, please contact me I I can’t seem to find a “contact” button…(I don’t blame you if intentional!). I would like to give you a video I took a few years back. I can’t think of a better person to give it to. The resolution is not great, but there are a few details you might find interesting. Great to see a dedicated site – always been impressed by your work. Hope to see more! thanks, love the mouth animation – first time I have seen that. I truly appreciate your work, and all the effort you have put into the enhancement of the film. I do have a question for you though, and hope you will take me seriously. I recently went to a site called “Bigfoot Encounters” which contains an enhancement on the facial profile of the creature. It is a set of rapidly advancing frames which move forward, stop, and then retract in order. The very last frame flashes twice (a second time as the sequence retracts). In this frame appears an anomaly I hope you may be able to investigate more fully. Please look intently just a bit to the right of what would be the left cheek area of the creature (right side of film). Your eyes need to become accustomed to the flashing of the photos, so it may take a little time before you can zero in on the area clearly. But as your eyes begin to adjust to the rhythm of the flashes, you can see much more clearly. In this last frame (which again flashes twice), in the left cheek area, appears a frame which appears to show the nose, unsmiling lips, and chin of a man. I am not sure if it is part of a “mask”, or in the background of the shot, or maybe even an area of film that was overlapped with another piece of film, thus showing a small part of another film. Proponents of the film have immediately written me off saying there is nothing there. However, people that I have shown who couldn’t care one way or the other say there is “something” there that looks very much like the partial profile of a man’s face. I would very much appreciate it, since it is your own enhancement, if you could take a close look at that frame, as I am sure you have access to it. If possible, could you e-mail me a copy of just that frame of film? I would really like to know what this object is in the film. Again, one must look intently in the area (left cheek) to see it as it is much smaller than the huge creature’s head. Might help if I put the link: sorry about that. I’m sorry for three posts in succession, but I looked at the succession of frames, and I may be mistaken about the frame being the last one (they flash so quickly it is hard to tell)–it may be the second frame in the sequence (the frame is definitely shown twice in the sequence though). I wish I knew how to go back and correct my earlier post, without having to post again. I just want to make sure you know which frame of film I am talking about. There appears to be a slightly larger frame in the far background–the sequence starts there–the first frame thereafter (you could call it second frame in the series) is the one with the profile. It appears to flash twice, but the frames are moving so rapidly that it is hard to tell. In the left cheek area of that frame is the object of which I am speaking. Again, my apologies for (4) posts, but I just wanted to be clear on what I am speaking of. Would it be possible for you to post that frame–or all of those frames separately? I’m not sure if you have the rights to e-mail to me or not. I am extremely interested in this. Thanks. (12) in the sequence. The head is starting to turn, and there appears to be the profile of a nose, unsmiling lips and chin actually in the fur itself. Is it an optical illusion, or could it be a man’s face? I disagree with those who say NOTHING is there—because there is. I just don’t know what it is. Thanks again. Perhaps you can comment when you get a chance. I do accept as true with all of the ideas you’ve offered to your post. They are really convincing and can certainly work. Still, the posts are very quick for newbies. May you please prolong them a bit from subsequent time? Thank you for the post. Your videos are extraordinary, however it would be to your advantage to maybe have some sort of triggering device where the hotspots are, particularly at night…. Possibly triggering spotlights or the like. Maybe even different cameras. What are your thoughts on the theory regarding two Sasquatch creatures in the raw footage of the Patterson-Gimlan film? There’s a link to a youtube video here: http://www.youtube.com/watch?v=_CqRfH3CX3w , that someone put together showing what they believe is a second sasquatch that retreats in an entirely different direction to the left of Patty’s position in the film. I must say, it’s very compelling. You can clearly see that the first figure in the frame is walking towards a drastically different tree line than Patty is. I was wondering if you have ever done any investigation into these early frames of the film to see whether or not there is in fact a second creature or if it’s just some kind of uncanny blob-squatch artifacts on the film negative. If you have already discussed this or have addressed your opinion, I’ve managed to missed it. I’d love to know you’re thoughts. If it is in fact true that there are multiple creatures on film, we have ourselves some more leverage in the debate about the authenticity of the PG footage. MK I would like to talk with you about the the clips with have been releasing this last year from Texas. Most of the clips were from my cameras at that site. I’m glad you have released them but some basic information you are missing. Please contact me. lets assume for a moment bob h. was big foot in the pgf …and lets assume mk davis is correct about the second bigfoot in the film . If this is correct than the second bigfoot is a man in a suit…if this is correct than Bob h. would know about the second man in a suit. Then why hasn’t Bob h. ever mentioned it? Marlon … not tryin’ to get personal, but are you from Louisiana? Just pickin’ up on a bit of Northeast Louisiana drawl. Saw the “Honey Island” segment on the “Bigfoot is Real” DVD for the first time this weekend. I like the way y’all approached explainin’ that, without bein’ too harsh. I had always thought the “casts” those folks was toutin’ was gator tracks … not imprints from some prosthetic-abomination attached to a shoe! Appreciate your posts … keep ’em comin’, bud! MK. Davis has supplied the bigfoot community with brilliant work and enlightened us all. Thru exhaustive research and effort we are in debt to his contributions toward clarity. Thanks MK for your time and appreciate the information provided during our conversation, Looking forward to corresponding with you regarding those future expeditions I spoke of scheduled for next fall. I hope all is well and your health is improving ( All the Best ). you are being ‘discovered’ all the time. your good and fascinating work. that only you seem to have answers to. 1924 “Apemen Attack” on a group of miners in Washington State. the apemen were (are), their state-of-being. When you have a few, on a rainy day, see what you think. I’d like to discuss the work you did on the Nix film back in December. It’s a very interesting observation you made there and I really like to know more. Could you be so kind to contact me? We would like to talk to you about appearing in an upcoming Bigfoot documentary. We are a renowned film studio that produces many reality documentaries on interesting subjects. The Bigfoot enigma is important to us so we are continually searching for new evidence and information to share with fellow Bigfoot enthusiasts. We’ve seen some of your research on youtube and appreciate it very much. Let me know your thoughts. but I’m not sure what the difference is. Could you clarify? have bred with humans to create a new species. Could that new species be bigfoot? If you have the time, could you do a video discussion on this topic? What ‘s with Artist’s First??. No April show yet. I contacted the AF admin and I was told they were having server problems. No date when the April show will be correctly posted, but at least they are aware of the problem. Let’s see when the show, shows up. Hello Mr. Davis. I’ve been watching your YouTube videos and really really appreciate the level of expertise and thoughtful balanced analysis! Please keep up the excellent work and I look forward to seeing more of your Bigfoot stuff. Mr Davis, growing up in the ’60s, like many baby boomers, I was treated to incredible wildlife images of Ivan Marx a few times a year on “The Wonderful World of Disney.” An proven nature cinematographer and tracker, who employed credible wildlife tracking techniques to capture images of his quarry, I believe, self-proclaimed Bigfoot “expert” Matt MoneyMaker (who couldn’t find his &%$ in a bathroom, let alone a Bigfoot in a forest) has in his own self interest, smeared Marx’s name, while aligning himself, for obvious reasons, with an admitted thief of religious relics and smuggler; Peter Bryne. All because of the disbelief in the conical head shape; a shape now being proven to exist in nature as demonstrated by the recent interest in “nephilim” skulls from Peru (skulls first shown to the world 40 yrs. ago by Eric VanDaniken). MM has led his often understudied followers in the disregard of such a cranial structure, as well as demonstrating his personal disregard for Native American wisdom. Despite the fact that Native peoples will tell you there are several body types of “sasquatch”, his cast of “experts” on FB clings to this premise. In fact on his trip to NEpal, in search of the Yeti, i believe he went as far as to question a sherpa’s eyewitness account of such a cranial structure, going as far as to suggest (and I am paraphrasing) it was simply a hairdo to shed the rain! In fact many reports of such skulls have been reported and can be seen in videos, despite the beliefs of MM followers who on this incorrect belief have branded Ivan Marx a hoaxer; well that and his audacity to claim he actually capture the creature on film using such “laughable” techniques as scent masking, blinds, the pursuit of spawns, and even the foolish idea of interviewing Native peoples or following their advice. Yes I too find some of his images questionable, but his first work, I do not. Growing up in the 60s I know the i unlikelihood of a full body suit being worn by his wife. But more importantly, I have, like yourself, personally examined some of those images; only to find what may be pathology or injury, even what may be a genetic anomaly, or possibly a captured creature being held in one of the image’s hand. I read that you examined the film or at least images from it, but can not find that analysis. Perhaps due to “hate mail” you removed it; as sadly, there seems little tolerance for discussion of the film among Bigfoot “experts;” especially those who simply regurgitate the opinions of others or scream CGI! or FAKE! at every chance; not appreciating the incredible amount of work or money, pulling off a hoax such as the PG film or an Ivan Marx creature would involve. Recent images from Pennsylvania and NY seem to show the exact same thinner type creature with a thinner build, and wild longer head hair, while the roadside (shoe-wearing) Penn creature with the incredibly arched back, matches perfectly the arched backs of the young Sasquatch doing a headstand under the tree! Yet I read… IT’s WEARING SHOES! or RIDICULOUS! posted under the images. Where do they sell all these different Bigfoot suits? The cost of implanting the hundreds of thousands of hairs must be astronomical! Yet so many seem to be able to afford them? To me, the creekside Marx creature or even the injured limping creature, also wearing elaborate suits, warrant further examination (if only for his wife’s sake) before such hasty judgement can be passed, Although, as I said, the later images are harder to believe, the world is now seeing what I have known for decades, there is precedent for such “laughable” images! I wondered if you had examined these images and what your take on them might be? If you do not want to post it here, I certainly understand. Thank You, Brett Allen Paranormal Researcher @ 40 yrs. Cover UFO Magazine 2007. I wonder if you realize the implications of the light flashes you, as well as many other electro-magnetic abilities reported by so many witnesses, effects also seen among paranormal researchers: shocks, electromagnetic malfunctions or yes even the ability to appear or disappear, all carry great weight as Biblical Nephilim… are part spirit! Always enjoy your work MK. Although I do disagree on Marx(to me his stuff is laughable)but find 99 percent of your work totally fascinating. I appreciate the time and effort you have put into this mystery that intrigues us all. I would love to have enough free time to do some of the things I would like to try as far as research goes and am very glad that you have the time to peruse the films that make us all wonder. Please keep up the good work my friend. LOVE ALL YOUR WORK M.K. DAVIS!! PLEASE ENHANCE MY FOOTAGE!!! THIS IS THE REAL DEAL!! left to speculate as to what was recorded. I have never seen or heard of this being done. see? This idea will eventually occur to someone, why don’t you do it first? Hello, I am a soundscape artist and I am working on an aural piece about bigfoot, Would you allow me to project your stabilized video image as part of the sound and light show to accompany my aural work. This would be a private performance in a private studio and not put online. I would give credit the night I performed it. Absolutely, you can use anything I have! Thanks for asking. Here is a video I did, and I have a better face pic!! Hey MK LOVE your work and TY TY TY for ALL you do for bigfoot!!!! Have you seen any of Robert Dodsons vids??? Specially the “bigfoot is pissed” or ” bigfoot could be one”???? They are AMAZING!!!!!! And with your techie skills i think you could make an AWESOME discovery!!!!!! Thnks again!!!!!! How can I send a video to you for analysis? I HAVE PROOF PATTY IS REAL, AND MK DAVIS IS CORRECT!! I HAVE A PICTURE OF ONE THAT HAS 3 SIMILARITIES WITH PATTY, NOT ONE, BUT 3!! Hah, nice one! Looks like a big tree on the left edge of the frame, so that “like-Patty” head must be what, 15-20 feet tall? Like a giant Easter Island Patty head growing in the forest? Mr Davis I have watched over and over your films ref the RP/PG film and find your investigation to bare fruit.. I at times wish that all of your films were connected and numbered as it is hard to watch them in order via You tube. I know much of what you say can draw the ire of people set in there ways however I for one question everything and feel it’s the only way to do a proper investigation. I have questions ref your opinion… Not proof but opinion. To me this seems as there may have been the killing of one or more of Pattys bloodline. Ie the tracking dog scene, the pitch forward of Patty herself, the use of the backhoe and the flash at the end of the film that seems to provoke the movement of an other such creature… After looking into Pattys eye and seeing the sad humanity there I wonder if this was a cover up by the parties involved.. Love to here your take on this. Hi!I am a producer for the Japanese TV program. I like to introduce to you a great video on the Japanese TV program. It is this:The Bluff Creek Croucher Video…What is in the Cloth?